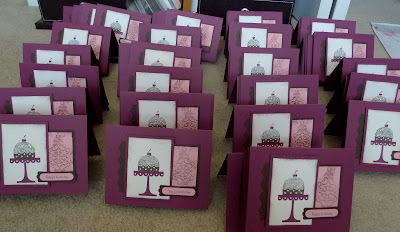 Karina's Kreations: 120 Workshop Wow Swaps! What does 120 workshop wow swaps look like? Here they are. They are stacked on top of each other and I hope they make it to Salt Lake City safely. I'm off to Salt Lake city for convention on Tuesday. I can't wait!!!!!! I signed up for a workshop wow swap on splitcoaststampers.com. I used a frosting technique on the cake and I hope everyone loves the cards. They were more work than I had initially planned. 1. Take a piece of 2-1/4" x 3-1/4" piece of Whisper White card stock and stamp a cake stand from the On a Pedestal stamp set in Rich Razzleberry ink. 2. Stamp a cake in Early Espresso ink using a stamp-a-ma-jig for placement, on top of the cake stand. 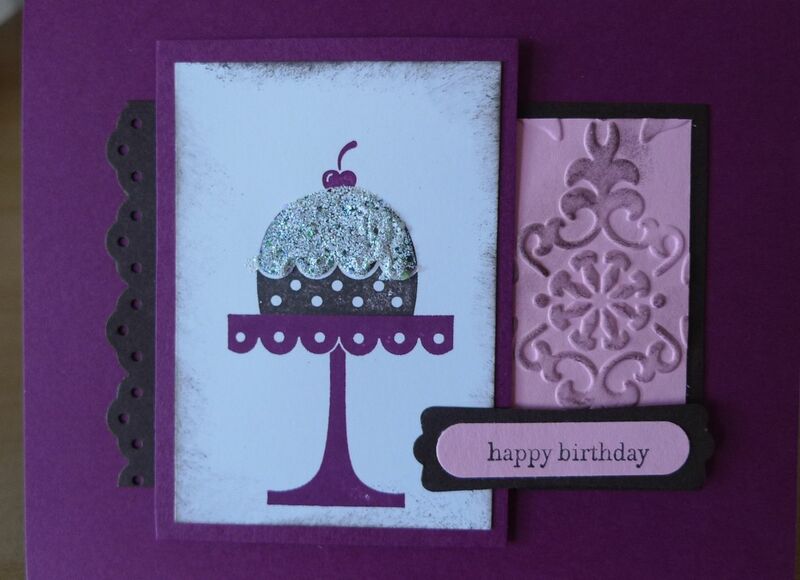 Stamp a cherry in Rich Razzleberry ink on top of the cake. 3. Sponge the edges of the Whisper White card stock with a Sponge and Early Espresso ink. Attach to a piece of 2-1/2" x 3-1/2" Rich Razzleberry card stock. Squeeze a thick layer of Tombo Mono Multi glue on the top part of the cake. Sprinkle on some frosting mixture and heat with a heat tool until it bubbles. Set aside to dry. 4. Make Rich Razzleberry card base cut at 5-1/2" x 81/2". 5. Cut a piece of 2-3/4" x 4-1/2" Early Espresso card stock and use the Eyelet Border Punch on one side. Attach to card base. 6. Place 2" x 2-1/2" Pretty in Pink card stock in the Vintage Wallpaper Textured Impressions Embossing Folder and run it through the Big shot die cut machine. Using a sponge dauber, sponge Early Espresso ink over the raised vintage image. Attach to the right hand side of the Early Espresso card stock. 7. 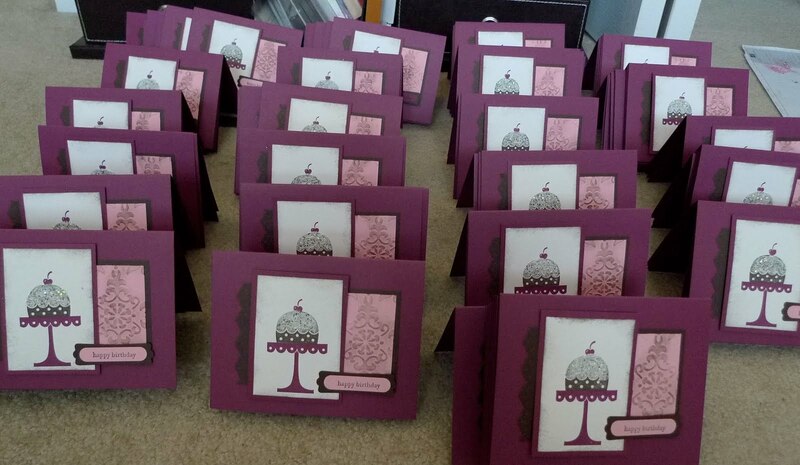 Attach the cake layer with Stampin' Dimensionals. 8. Stamp " Happy Birthday" from Teeny Tiny Wishes stamp set on Pretty in Pink card stock. Punch it out with the Word Window punch. Layer it on a piece of Early Espresso card stock that was punched out with the Modern Label punch. Attach to card base.